The photographer who took this enchanting scene for Mr. Letchworth was standing near what is the present day parking lot just north of the Museum. At that time it was the edge of a garden. 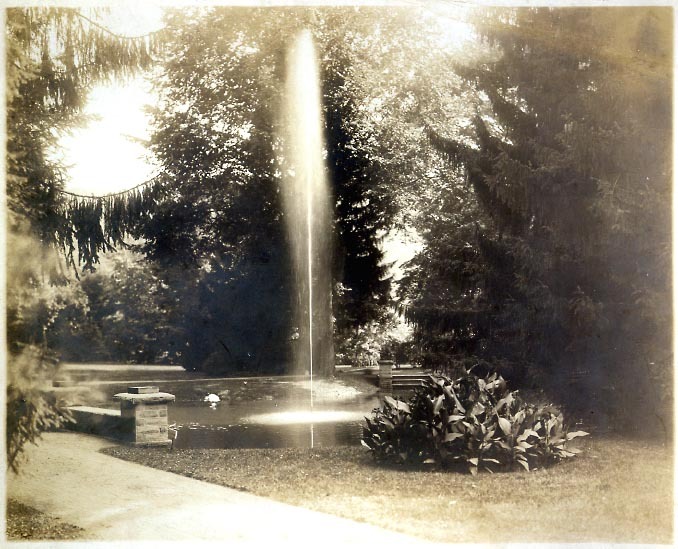 The image highlights the wonderful fountain and pond that was constructed in the early 1860's. (see The Ornamental Farm). The Glen Iris is not visible, but would be to the far right. In the foreground is one of the Glen Iris paths which would have to be widened a generation later to accomodate automobiles. Development of the Park would also impact the pond. Although it is now smaller than in Mr. Letchworth's time, the "goldfish pond" and graceful fountain are still popular with visitors. 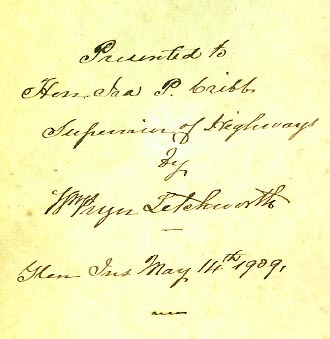 This image may have been a favorite of Mr. Letchworth. As shown to the right, he signed one of the prints and sent it to an acquaintance as a gift.